I, Bryan C. Ward, do solemnly swear that I will support and defend the Constitution of the United States, and the Constitution of the State of West Virginia, against all enemies, foreign and domestic, and that I will faithfully discharge the duties of the office of Sheriff of Hardy County to the best of my skill and judgement, so help me God. The information “exchange” requires your interest and involvement. Our effort to identify, prevent, and solve community problems, begins with you. Though our deputies are well trained and eager to keep Hardy County safe, we are only as good as the information we get. If you can provide information on the whereabouts of a wanted person, please use our ANONYMOUS "WANTED PERSON TIP LINE". If you wish to report any unsafe or unlawful, activity, please use our ANONYMOUS "CRIME TIP LINE"
The Lee District of the George Washington Jefferson National Forest in Partnership with the Hardy County Sheriff asked that if you spot a meth lab report it immediately. Here is how you spot a Meth Lab: What's cooking in the forest and What is a Meth Lab. If you have any drug information that will be useful to our drug interdiction team, please use our ANONYMOUS "HARDY COUNTY DRUG TASK FORCE TIP LINE". Each of these tip lines has been constructed to insure anonymous reporting. If you wish to have a deputy contact you in regards to your tips, please leave your name and contract information in message box. The information that you provide is always confidential and crucial to our success. necessary to slow that person's speed. Requests will be kept confidential. Fill out and print the crime prevention form here and mail or fax to the Hardy County Sheriff's Office. Record your personal firearms form here and keep for your record. This security check service in no way guarantees that your property will be safer from vandalism or burglary, but merely provides the Sheriff's Office with information of your whereabouts and other pertinent facts if a crime should occur. Fill out and print the security check form here and mail or fax to the Hardy County Sheriff's Office. The law assigns to Sheriffs and their Deputies a wide range of responsibilities, including a variety of functions in the courts, enforcing laws and apprehending criminals, serving criminal and civil process, and transporting prisoners. And as they county’s population grows, so does the demand on the Sheriff’s Office and its budget. The Bailiff’s duties include keeping the peace and assisting the judge, witnesses and jury, escorting criminal defendants, calling witnesses, and executing the orders of the court. Deputy Sheriffs also are required to serve as officers in Magistrate Court, in Family Law Master Court, at parenting classes conducted under the auspices of the Family Law Master, and at commitment proceedings conducted by the Mental Hygiene Commissioner. Sworn deputies in the Law Enforcement Division are also responsible for serving writs, subpoenas, summons, and other court orders, and processing extraditions. The Office of the Sheriff is the chief law enforcement agency in Hardy County, charged with enforcing state and county laws and ordinances. Town police, though, provide local law enforcement in the incorporated towns of Moorefield and Wardensville. Among the Sheriff’s duties are the enforcement of traffic laws and accident investigations, and criminal investigations related to a wide variety of offenses including drug possession and trafficking, burglary and larceny, and domestic violence. 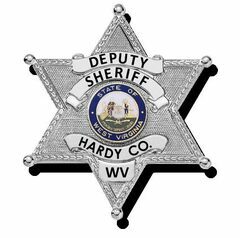 Hardy County deputies regularly cooperate with law officers from other agencies and jurisdictions – including the West Virginia State Police, Department of Natural Resources, and town police – to carry out their enforcement duties. Individuals awaiting hearings or trial, or who are sentenced to serve time in jail are confined at the Regional Jail in Augusta, WV. The Sheriff’s office also is responsible for overseeing the “Home Incarceration” program, under which courts may order defendants to restrict their movement to home and work locations as an alternative to serving sentences in the Regional Jail. Whenever someone is arrested and held for a hearing or trial, that person is transported to the Regional Jail at Augusta, WV. Regardless of what agency makes an arrest, the Sheriff’s department is responsible for holding the individual for transport to Augusta. County deputies also are responsible for taking custody of prisoners at any location, near or far, and returning them to Hardy County. Deputies routinely travel to other states to pick up and return prisoners. Under West Virginia law the Sheriff's department is responsible for enforcing animal humane laws in Hardy County. Deputies are required to investigate complaints and to take action to prevent the perpetration or continuation of inhumane treatment of animals. Failure to do so is cause for removal from office. County deputies also are empowered to enforce the state’s wildlife and natural resources conservation laws. Permits to carry a concealed weapon (CCW) are issued by the Office of the Sheriff following application and a background clearance check. To be eligible for a CCW permit, you must be a resident of the West Virginia county in which you apply. Certain classes of people, including convicted felons, are precluded from holding a CCW permit. To apply, you must personally go to the Sheriff’s office to obtain an application. At the time you submit an application you will be required to show your Driver’s License or state-issued identification card and your certificate of firearms training (an NRA firearms safety class or similar training qualifies). With your application, the Sheriff’s Office will collect a $75 fee. If you successfully pass a criminal background check by the West Virginia State Police, the Sheriff’s Office will issue a CCW permit, which is effective for five years. To receive the permit, you must personally appear at the Sheriff’s office and pay a $25 permit fee. You will be provided with a photo ID. Q. Do I have to carry my CCW permit with me? A. You must have a Photo ID and CCW on your person when carrying a concealed weapon in West Virginia. West Virginia’s permit is a handgun permit only and does not allow for the carrying of other deadly weapons such as knives and billy clubs. A. West Virginia currently honors concealed weapon permits issued by the States of Arizona, Arkansaw, Florida, Kentucky, Louisanna, Michigan, Mississippi, Missouri, North Carolina, Ohio, Oklahoma, Pennsulvania, South Carolina, South Dakota, Tennessee, Utah, Virginia, and Alaska. Currently, no other out-of-state concealed carry permits are honored. Our law was changed to permit reciprocal agreements with other states and our Governor's Office is beginning that process. Please consult with authorities in your state in order to determine if a reciprocal agreement has been made with West Virginia. Q. Are there places where I am prohibited from carrying a concealed weapon? A. Yes. Weapons are forbidden in courthouses, family law masters office, magistrate’s office, primary and secondary school property including school buses. Any facility that is being used for a primary or secondary school function while that function is going on. Anywhere a sign is posted saying No Firearms Allowed. The signs do not have to be of any set size or design. All Federal restrictions apply. Firearms are not permitted in federal buildings, post offices, military compounds, federal courthouses, and the like. Q. Is it lawful to carry uncased hunting weapons (e.g. rifles, shotguns, and pistols) in my vehicle when I travel in West Virginia? A. Weapons intended for hunting must be unloaded and in a case when transported in a vehicle. Q. I am a police officer from another state who will be traveling through West Virginia. May I lawfully carry my service weapon? A. West Virginia law permits anyone who can lawfully possess a handgun to carry an unconcealed handgun. If you choose to carry an unconcealed handgun in your vehicle and you are stopped for a traffic violation, you must understand that the handgun will immediately attract the attention of the police officer. The presence of the handgun may lead to action by the officer such as drawing his or her weapon, ordering you from your vehicle, and performing a pat-down search. Vehicle stops are inherently dangerous for police officers and these actions have been held to be lawful by the United States Supreme Court. Hardy County sheriff’s deputies serve as bailiffs in the Circuit Court, Magistrate Court, and Family Court. Their roles include maintaining the peace and security of the courthouse and courtrooms, assisting judges and other judicial officers, calling witnesses, assisting juries, and transporting prisoners. The Sheriff’s office also has responsibility for maintaining the peace at parenting sessions conducted under auspices of the Family Law Judge, and for accompanying parties to proceedings conducted by the County Mental Hygiene Commissioner. Service of process is the delivery of court papers to a party, witness or other person named in a court or other adversarial proceeding or who has a stake in a case. When a person has been provided with formal notice of the filing of a lawsuit (that is, that he has been sued), of a court hearing or trial, or ordering him to attend a hearing, trial or deposition, that person is said to have been served. Depending upon the nature and circumstances of the cause, service of process is carried out in person, by mail, by delivery to a person’s home, or by publication. When personal service is required, the Office of the Sheriff, for example, may be ordered to summon defendants to appear in court, or subpoena witnesses to a legal proceeding, or arrest someone under a writ of capias. The service of civil process - summonses, subpoenas and other notices - is managed by a full-time process server, Mike Snyder. Deputies in the Law Enforcement Division handle service of criminal process - warrants and writs. Not all civil process originates with the court system. Other types of documents qualify for service by the Sheriff's office. A $25 fee applies to all service of process. One of the principal duties of the Sheriff's office is transporting prisoners and fugitives. Hardy County Deputies are responsible for escorting prisoners to and from court for hearings and trials, to ensure public safety. Regardless of what law enforcement agency arrests a person, it falls to the Sheriff's department to transport the individual. The Sheriff's office is also responsible for traveling to other states to take into custody and return to Hardy County fugitives being held in other states.